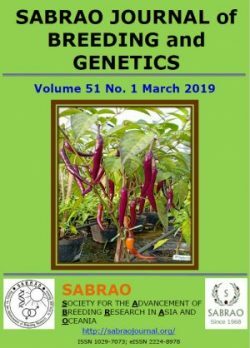 This first issue for 2019 covers articles on artichoke, rice, taro, jackfruit, sugarcane and cowpea. Songsri P, Jogloy S, Holbrook CC, Puangbut D (2019). Determination of lethal dose and effect of gamma rays on growth and tuber yield of Jerusalem artichoke mutant. SABRAO J. Breed. Genet. 51: 1-11. Jumaa SH, Redoña ED, Walker T, Gao W, Reddy KR (2019). Developing screening tools for early-season high- and low-temperature stress tolerance in rice. SABRAO J. Breed. Genet. 51: 12-36. Oktavianingsih L, Suharyanto E, Daryono BS, Purnomo (2019). Morphological characters variability of taro (Colocasia spp.) in Kalimantan, Indonesia based on phenetic analysis approach. SABRAO J. Breed. Genet. 51: 37-56. Palupi D, Rahayu SSB, Daryono BS (2019). Genetic diversity in jackfruit (Artocarpus heterophyllus Lam.) based on molecular characters in Indonesia. SABRAO J. Breed. Genet. 51: 57-67. Herawati R, Masdar, Alnopri (2019). Genetic analysis of grain yield of F4 populations for developing new type of upland rice. SABRAO J. Breed. Genet. 51: 68-79. Palachai CH, Songsri P, Jongrungklang N (2019). Comparison of yield components of sugarcane varieties grown under natural short- and long-term water-logged conditions in Thailand. SABRAO J. Breed. Genet. 51: 80-92. Karuwal RL, Suharsono, Tjahjoleksono A, Hanif N (2019). Evaluation of cowpea cultivars from Southwest Maluku – Indonesia under different environments based on morphological characters. SABRAO J. Breed. Genet. 51: 93-106.